We investigate the vibrational spectrum of the polymer-water interface using normal mode analysis and discuss the vibrations that are localized at the interface. We study a hydrophobic polymer (polyethylene) and a hydrophilic polymer (polyketone). 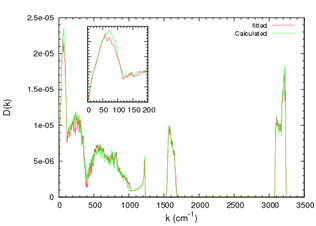 We find that both hydrophobic and pure hydrophilic interfaces have the same fingerprint frequency around 75 cm-1- (2.25 THz) in the density-of-states spectrum. This is in agreement with experiments that showed that a hydrated protein (with a mixture of hydrophilic and hydrophobic interfaces) has an absorption peak in the interval from 2.25 to 2.55 THz. Additionally we observe driven oscillations (slaving) of the H2O network in the frequency region, where the pure H2O network has a band gap but the polymer spectrum is nonzero. In this frequency region the hydrophilic interface differs from the hydrophobic interface. 70% of the energy of the driven oscillation is distributed in a shell of 0.1 nm width from the hydrophilic polyketone, while this fraction reduces to 45% for the hydrophobic polyethylene. Our results contribute to the understanding of the hydration shell behavior of proteins since their hydrophilic properties are lying between our models (polyethylene and polyketone).